Chip multiprocessors (CMPs) usually employ shared, last-level caches to use on-chip memory resources effectively. Unfortunately, conventional replacement policies applied to shared caches fail to partition memory resources among cores to achieve an optimal execution throughput. This paper presents a novel replacement policy that dynamically estimates how many misses would be eliminated if one more block per set would be allocated to a certain processor taking into account the extra misses for some other processor. Our implementation makes novel use of shadow tags for the estimation. We show that it can yield 50% higher execution throughput on a 4-way CMP and in contrast to previously proposed schemes, we did not observe any noticeable degradation of performance for any application in the SPEC2000 we used. 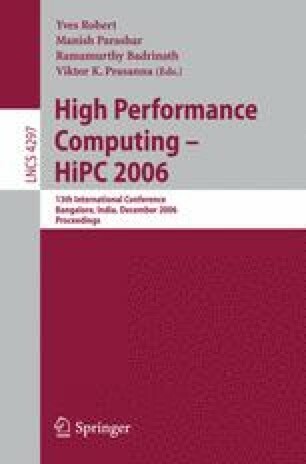 This work is partly sponsored by the HiPEAC Network of Excellence funded by EU under FP6.